Seattle Seahawks: What’s the deal, literally? After February, it has been a disheartening time for Seahawks fans. Arguably one of the worst play calls in NFL history, Seattle has never been so quiet in the late winter. Many diehard Seahawks fans planned to “hibernate” until next season. During this off-time, however, coach Pete Carroll seems unaffected, and his attitude likely transferred to the players. Coach has admitted he could not sleep ~2-3 days after the super bowl, but for such a devastating play that lasted 5 seconds, much coaches would suffer much longer. Carroll’s attitude has not stuck with many Seahawks fans, since he is often blamed as the perpetrator of the play call. But again, his recovery period has shocked everyone. During the summer offseason, the Seahawks made a blockbuster trade with the Saints to acquire all-star tight end Jimmy Graham in exchange for Seahawk’s center Max Unger. While Graham will provide better offense, the Seahawk’s offensive line will suffer. Unger was the one of the best, most reliable center snappers in the NFC, and possibly in the NFL. Let’s be honest, the Seahawk’s offensive line is not very good, and without Unger, we are travelling in some deep waters. The Seahawk’s weak offensive line explains the reason for Marshawn Lynch’s physical running style– the offensive line is not mobile and tactful enough to block defensive targets, so Lynch’s only option is to run through them. 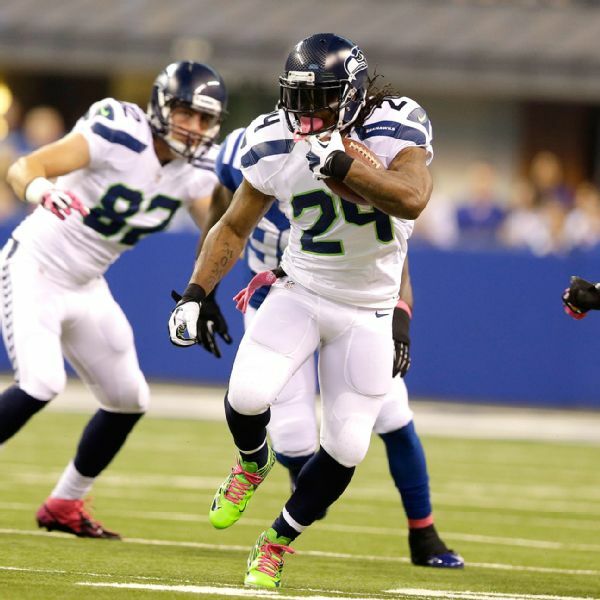 As a result of Lynch’s physical running style, it is harder on his body; this is why Lynch plans to end his career in Seattle after this year. Even after Lynch’s career, he seems to have an optimal lifestyle with his profitable “Beast Mode” clothing line and charitable funds for children in Oakland. Jimmy Graham will provide excellent mid-field offense and red-zone availability, but again, without skilled linemen like Unger, the rush will be intensified and shortened for QB Russell Wilson. Speaking of Wilson, he just accepted a 4-year, $87.6 million extension with the Seahawks; this includes a $31 million signing bonus and ~$60 million of guaranteed money as of this morning. When we ponder the phrase, “What’s the deal?” in the title, we do not question the talent and ability of the Seahawks. The Seahawks still undoubtedly remain one of the best teams in the NFL because of their speed, teamwork, size, and overall capability to win games (adapted from the common 12th man phrase: “Bigger Faster Stronger Louder”). The deal is literally translated as the money contracts, the extensions, and the requests from the Seahawks players. Yes, we understand that most people could use extra money, but being a pro-athlete where you are already making a comfortable salary, is the money request really necessary? All this money talk puts a stamp on your talent and ability, but aren’t the Seahawks grounded on teamwork and helping another out? The contract bonuses and extensions seem to take away from the natural competitive drive of football, and it pressures other teammates to behave in a similar fashion. Pete Carroll and John Schneider have satisfied most Seahawks fans, and this is because they are establishing long-term contracts for the faces of the Seahawk’s organization: Russell Wilson, Marshawn Lynch (and now Jimmy Graham), Richard Sherman, Earl Thomas III, Kam Chancellor, Bobby Wagner, and Michael Bennett. Russell Wilson: Just signed a 4-year, $87.6 million contract extension. Earl Thomas III: Last year, signed a 4-year, $40 million contract. Richard Sherman: Last year, signed a 4-year, $56 million contract. Kam Chancellor: Currently requesting a new contract (boycotting Seahawk’s training camp practices), signed a 4-year, $28 million contract in 2013. Jimmy Graham: Acquired this year from the Saints, signed a 4-year, $40 million contract in 2014. Bobby Wagner: Just signed a 4-year, $43 million contract extension. Michael Bennett: Last year, signed a 4-year, $28.5 million contract. Overall, the Seahawks are still one of the best teams in the NFL. However, it is important for the players to realize that a successful team does always not come from money. The 12th man is integral to the Seahawk’s success, and our fan base is unlike no other. Let’s keep it that way, and the players need to focus on the game– the 2015-16 season is almost a month away! Have a different perspective or opinion? We would love to hear your questions, comments, and overall feedback. You can always contact us at Magnolia Insurance Agency.